If you have access to each side of your bar molding, bar mount brackets are a great option for both a classy look and an added level of convenience. Built from stainless steel and in an Oil Rubbed Bronze finish, this bar bracket, along with 2" metal tubing and other matching components, is a luxurious, convenient addition to any home or commercial bar. The sleek bronze finish of this bar bracket will precisely match your Oil Rubbed Bronze two-inch outside diameter bar rail tubing. Bar mount brackets include a back access bolt to allow for weight bearing on the bar rail. To install the bar rail bracket, you will need to use a screwdriver to attach the 3 mounting screws on the front end of the bar facing, and the nut and bolt assembly on the back end of the bar. The set screw goes into the hole where the bracket holds the tube and is screwed into the bar rail tubing. Item was perfect and customer support was the best. Re-sent missing item, no questions asked. Would definitely do business again. Keeps shoes and especially boots off special made wood front desk. Just have wiped it down for nearly two years now when dirty and barely can see any scratches with bright light at 2' away. Considering I see a lot of pediatric patients and they like to walk on the bar I'm seriously impressed. 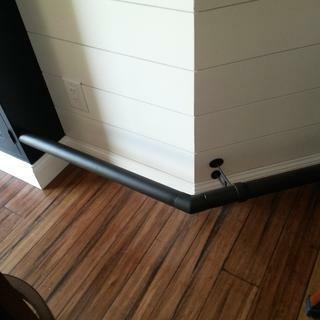 We just installed the oil rubbed bronze 2" bar mount foot rail on a 10 foot bar in our media room. It looks great and you can tell it's good quality and will hold up over time. It's always nerve racking buying on line (especially with a company you haven't used before) but I must say we are pleasantly surprised and hope to get many years of use out of this. I used hanger bolts to mount the foot brackets onto a wall, then added longer screws into the stud for secure mounting. End cap served in place of a flange against a cabinet on one end. The bracket on our bar has broken. I needed a replacement. I was happy that you had the item in stock. I am looking forward to receiving the bracket. attractive. also, unwilling to drill a hole in tile for a bracket, just wall mount. didn't want to worry about cleaning around the foot on the floor. this bracket is completely off the ground and I'm pretty sure I can access the back of the bar to get the bolt all the way through. 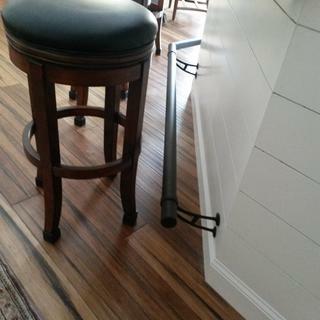 I bought this bracket for my kitchen island with a tall counter so it is easier to sit on my 30" bar stools. I have hardwood floors and didnt want to drill into them or have to clean around the bracket. These should go well with my bronze cabinets. The floor of this project is tile and I didn't want to make any penetrations, so I decided on the baseboard brackets where I could make secure fastening to the cherry baseboard. what is the typical gap between brackets? BEST ANSWER: Depends on application. For true bar setting with stools so patrons are a little tight I would say 3'. Any other setting 4' for groups of people using as foot rest. For occasional person and ur just ting to protect say a nice large wood desk and one or two people may put feet on or the inevitable kid then 5' at most. Hope this helps. I used Schedule 40 black iron pipe for my rail. Part of the aesthetics for the bar I built. It's 4-5 times thicker than the tubing normally used for railing. But I still used the normal 3-4 foot support spacing. Over 5 foot I would not recommend. Hope that helps. My installer spaced the brackets 2 feet apart. He aligned each bracket in the middle of each raised panel on the exterior of the bar. It seems to be really solid with no flex or movement on the rail. I spaced my brackets 3ft 6in. It's been up for 1 1/2 years and I have had no problems. Want to aim for 3-4 ft depending on how rough your friends are. I want to use a hanger bolt into a stud rather than a thru bolt since there is no access to the back side. Would this work OK? BEST ANSWER: That's exactly what I did. Make sure your hanger bolt is long enough to "hold weight", but not too long to go through or split the stud. The challenge then becomes lining up your hanger bolts (pre drill holes). I put up 3 brackets and did not align them perfectly, so pushing the rail through was a challenge. I did find some similar bronze rub spray paint for touch up. My other challenge was that I mounted it to faux stone. I put the hanger bolts in first, modified the stone to fit it snuggly, then drilled through the stone for the bottom screw. I had to do exactly that. Other than pre-drilling the holes so as to eliminate the risk of snapping the bolt head, no special care was given. There have been no negative consequences to this installation method. For aesthetic reasons, I spray painted the hangar bolt heads before use and then touched up the scratches with a permanent marker after installation. I avoided getting spray paint on the threads by inserting the bolts into a paper plate leaving only the head exposed, this made painting easier as well as faster. Hope this helps. I don't think what you used was a hanger bolt. Hanger bolts do not have a head, they are threaded on both ends, one end with a wood screw thread, the other end with a machine screw. The wood screw end would go into a pre-drilled hole in the stud. Then you would have to turn the bracket onto the exposed machine screw end. To get the hole in the stud straight, I intend to drill a hole thru a 2 inch thick block on a drill press, then use this block as a guide for the pilot hole. I used standard 3" (#9) construction screws into stud to mount my brackets and it doesn't budge a bit when I stand on it (160 lbs). I don't believe these screws will release no matter how much a person weighs. How much weight would it take to pull 3 x 3" long screws from a stud? I completed my installation using hanger bolts. I had to order hanger bolts from a metric supply house since the thread was 8mm. I also used 3 inch long screws in the other holes angled into the studs. Pre-drilled everything to avoid splitting the stud. I would think so as long as your using a cap nut, wing nut or something so it doesn't back out and is firmly attached to stud. A hanger bolt is a threaded connector that is a wood screw on one end and a machine screw on the other. Typically used to hang swag-type lamps and create a way to mix the screw threads. They come in larger thread sizes for heavier-duty applications. There is no opportunity to use any kind of nut because there is no access to the backside of the stud. Someone from Kegworks responded that a hanger bolt should work. I think this is correct so long as the hanger bolt can be of an adequate diameter and length. Yes, that would work. I only had 1 out of four that I could get to on the back side.